In the history of web development technologies, we’ve never seen a technology like Node.JS becoming mainstream this quickly. 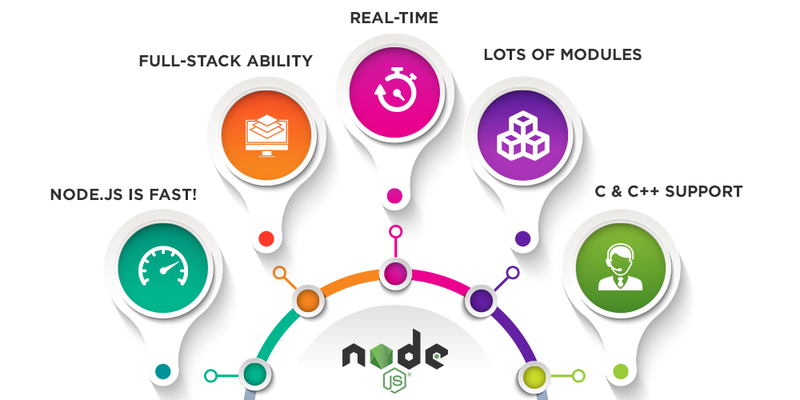 Today, Node.JS has become the go-to-technology for all kinds of businesses and companies. According to 2017 User Survey Report, Node.JS has about 7 Million users with a 100% growth rate on yearly-basis. And not only that, but Uber, LinkedIn, Netflix, and even NASA has tested and embraced Node.JS for some time now. The Node.JS Foundation also revealed that 98% of Fortune 500 companies use Node.JS on regular-basis. And, 96% of IoT companies prefer using Node.JS for IoT application development. All these statistics clearly proves that Node.JS is definitely taking the web market by storm. But, if you’re still not convinced yet, let’s get to specific reasons why Node.JS is better for web app development in 2018. As a matter of fact, many global enterprises have benefited in a great way with this feature. For example, LinkedIn migrated from Ruby on Rails to Node.js for the sole purpose of their mobile traffic, which also reduced their number of servers from 30 to 3. Additionally, the Node.JS migration also made their application 20x times swifter. That’s quite a feat, don’t you think? In simple terms, the data changes done at server-side appears immediately at client-side, and the web page that displays those data automatically makes the updates. Gone are the days of low-level sockets and protocols. With Node.JS you can develop real-time web application just in the same time needed to develop a simple blog using PHP. The event-driven architecture that we talked above, caters to both server as well as client side, making synchronization process fast and neat. Plus, the event loop that works on TCP web socket protocol also handles the multi-user function and block overhead of HTTP in real-time web app development. Overall, Node.JS is definitely a winner when it comes to multi-user, real-time web application development. Node.JS is an open-source platform that encourages sharing. In fact, the community has been so much active that there are over 400,000 modules available on Github and Stackoverflow which can be found by Node Package Manager’s official website. Lastly, NodeJS also supports C as well as C++ programming languages to speed up the processing. The add-ons in Node.JS are dynamically-linked & shared objects, programmed in C++, making it possible to load them into Node.JS through require() function. All in all, if you’re on a tight budget for building a complex web app, Node.JS is the right key to your web development project success.